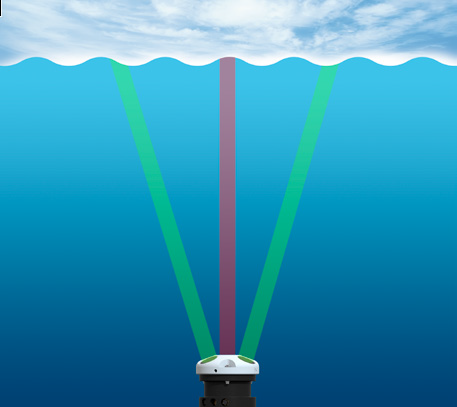 The use of a moored (sitting on the bottom) upward-looking acoustic Doppler current profiler (ADCP) allows to capture hydrodynamics of water column above the instrument. It is also possible to couple those profiles with variations in water depth. In the nearshore and inner-shelf environments, we expect water motions to be influenced by a combination of surface gravity waves, tides, and wind-driven currents. ADCPs suitable for this environments use frequencies around 1 MHz with typical 50-cm cells profiles and sampling at 2 Hz. However, cells may be reduced up to 5 cm. It is possible to measure both velocities and returned signal strength. Latter, after calibration, could serve as a proxy for sediment concentration. Terray, E., Brumley, B. H., & Strong, B. (1999, March). Measuring waves and currents with an upward-looking ADCP. In Current Measurement, 1999. Proceedings of the IEEE Sixth Working Conference on (pp. 66-71). IEEE.